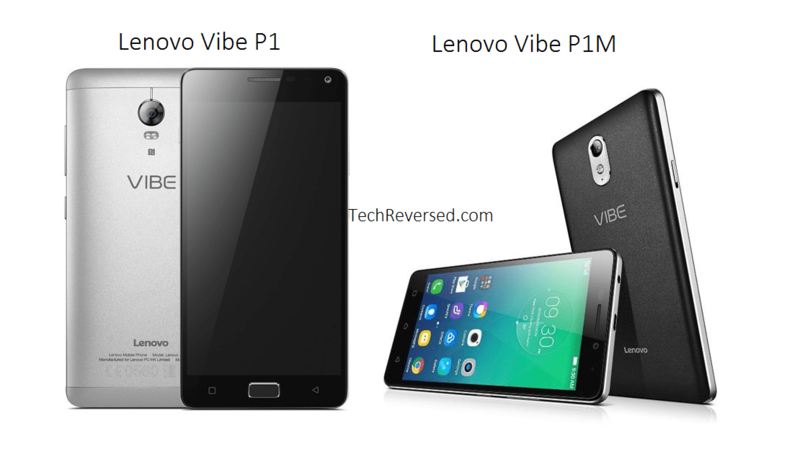 UPDATE: Hi Techies, In this post we will discuss Lenovo Vibe P1 & Lenovo Vibe P1M Specifications, Price in India, Features & More. The Lenovo Vibe P1 Sports a 1.5 GHz Octa Core Snapdragon 615 CPU, 2 GB Ram, 5.5 Inch Full H.D I.P.S Display. Whereas the Lenovo Vibe P1M is equipped by a Quad Core CPU, 2 GB Ram and a 5 Inch H.D Display. The Great thing about these phones is their huge batteries, the P1 has a 5000 m.Ah battery whereas the P1 M has a 3,900 m.Ah battery which can easily last for a day or two with moderate usage. The Vibe P1 & P1M are now available in India. Direct Links are provided in the Price & Availability section. Huge 5000 m.Ah battery. (Which could last for two days as claimed by the company). OS Android OS, v 5.1. (Lollipop.). CPU/GPU CPU 64 Bit 1.5 GHz Quad-core & 1.0 GHZ Quad-core Cortex A-53 with. Qualcomm M.S.M 8939 Snapdragon 615. | GPU Adreno 405. DISPLAY 5.5 Inch Full H.D. I.P.S LCD Display. Resolution 1920 x 1080 pixels (~401 p.p.i pixel density). CAMERA REAR 13 MP. Resolution 4128 x 3096 pixels. Auto focus with Dual LED flash. | Features: Geo-tagging, touch focus, face/smile detection, panorama, H.D.R. | Video Features: 1080 p @ 30 F.P.S. | FRONT/SELFIE CAMERA 5 MP. BATTERY Non-removable Li-Po 5000 m.A.h. STORAGE 32 GB Internal. Expandable Up to 128 GB Via Micro SD Card. (using SIM slot 2). FEATURES Huge 5000 m.Ah battery. | Fast Battery Charging. | 4 G Support. | Corning Gorilla Glass 3 Protection on Screen. CONNECTIVITY Bluetooth v 4.1. | W.i-F.i 802.11 a/b/g/n/ac. (Dual Band). W.I-F.I Direct, Hot spot. | Dual SIM (G.S.M). (Size Nano S.I.M). CPU/GPU CPU 64 Bit 1.0 GHz Quad Core Media-Tek MT 6735 P. | GPU Mali T 720. DISPLAY 5 Inch H.D I.P.S LCD. Resolution 1280 x 720 pixels (~294 p.p.i pixel density). CAMERA REAR 8 MP. Resolution 3264 x 2448. Auto focus with LED flash. | Features: Touch focus, face/smile detection, Geo-tagging. | Video Features: 1080 p @ 30 F.P.S, | FRONT/SELFIE CAMERA 5 MP. STORAGE 16 GB Internal. Expandable Up to 32 GB Via micro SD Card. (using SIM slot 2). FEATURES Huge 3900 m.Ah battery. | Fast Battery Charging. | 4 G Support. CONNECTIVITY Bluetooth v 4.1. | W.i-F.i 802.11 b/g/n. Hot spot. | Dual SIM (G.S.M). ). (Size Micro S.I.M). It is launched in India for a price tag of 15,999 Rupees. Wanna Buy Lenovo Vibe P1 (Flipkart Link)<– Check Here. It is launched in India for a price tag of 7,999 Rupees. Wanna Buy Lenovo Vibe P1M (Flipkart Link)<– Check Here.